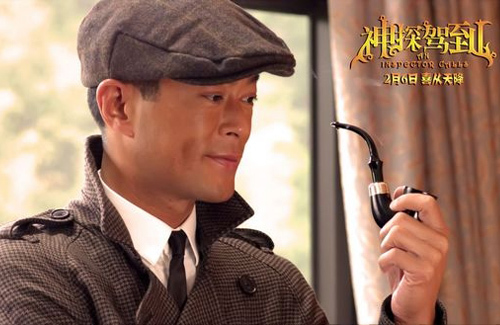 Featuring a star-studded cast led by Louis Koo (古天樂) and backed by an award-winning production team, detective comedy An Inspector Calls <神探駕到> is expected to top the Lunar New Year box office. The film is slotted for a February 6 release. Adopting a quirky and exaggerated style of cinematography and music, An Inspector Calls tells the story of the mysterious death of a young woman embroiled in the rivalry between two prominent and wealth families, six strange and sinister suspects, and how the most unlikely detective came to crack the case. Louis stars as the bumbling and lazy fraudster who successfully passes himself off as a detective and takes on the case. Surprisingly, he manageds to eventually solve the case by relying on his glib tongue and quick wits. Also starring in the film are Teresa Mo (毛舜筠) as a wannabe gold-digger, Karena Ng (吳千語) as a spoilt little heiress, Chrissie Chau (周秀娜) as a mysterious lady with several different identities, Han Chang (張翰) who plays an idle wealthy heir, Eric Tsang (曾志偉) who plays a wealthy patriarch known for his petty nature, and Gordon Lam (林家棟) who plays an eccentric wealthy young man who loves to sleep all day. Donnie Yen (甄子丹) and Kelly Chen (陳慧琳) will also be making cameo appearances in the film, although details of their characters have not been revealed yet. Looks like a great movie you gotta watch the trailer to know and the movie of course. Ew, Little Sugar BB Karena Ng is in it. Skip !! Cool! It’s a very famous Broadway play, not sure if the plots are the same but the storyline sounds similar. But I think Sean Lau would be more suitable for the role. more Mr Louis Koo! He is everywhere! Typical HK lunar new year crap. I’ll pass. I love louis koo more than the next female does, but seriously why is he in every film? Not complaining, just thinking when does he take a break? ?